Shoes in beiges, browns, and flesh tones may sound dull, drab, and safe. 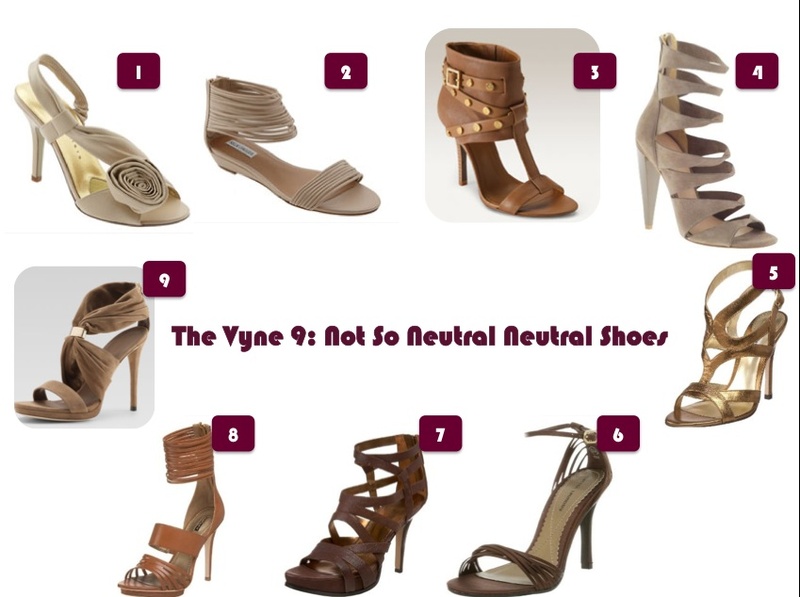 But in this week’s The Vyne 9, we’ve found nine pairs of neutral colored shoes that are anything but dull. 1. Pinkberry Cone– It’s about time – the healthy, yummy fro-yo from Pinkberry can now be held in one hand! 2. MacBook Pro – Though Kailei was a Mac and Keesha was a PC, Keesha has now converted and can’t get enough of her MacBookPro. 3. MD Skincare 4-in-1 Facial Treatment – These individually wrapped wipes are great when traveling, to remove make-up, and/or to get rid of the dirt and grime that may build up on your face during the day. It keeps your face feeling clean without stripping the oil or leaving a residue. 4. Banana Republic Indigo Skinny Cropped Jean – A skinny jean that can be worn even if you’re a little curvy. An ideal casual jean. 5. Anthropologie Leaps and Bounds Belt – With both brown and black on this versatile belt, it can go with just about anything. Put it on over a crisp white shirt or a turquoise dress. 6. Bobbi Brown Cosmetics – We’re loving Bobbi Brown right now. From the foundation to the mascara, to lip gloss, lip color or bronzer, Bobbi is making us feel oh so pretty. 7. Coconut Water – Move over Smart Water, Vitamin Water and G2, there’s a new beverage in town loaded with electrolytes and nutrition. Who knew that coconut water was packed with potassium, Vitamin C and promotes healthy skin and strong immune system? There are quite a few brands out there offering different flavors. 8. Hanky Panky Lace Trim Mid Rise Thong – If you don’t have any Hanky Pankies, you are late to the party. Whoever said thongs are uncomfortable obviously never wore Hanky Pankies. 9. Keurig Single Serve Coffee Maker – If you still have a coffee maker requiring pouring coffee into a filter, you need to read on. A single serve coffee maker is the way to go! Keurig has one that uses small coffee filled “K-cups” and all you need to do is put one in, press the button and voila! You have a freshly brewed cup of coffee. Try Gloria Jean’s Butter Toffee coffee for your morning brew.